All Star is equipped with experienced instructors both in the car and in the classroom who combined give students the solid foundation they need. All Star teaches students to become successful drivers and maintain a clean driving record. All Star puts their students first, trying to keep prices as low as possible. All Star will match any price in your area, as well as providing group discounts of $10.00 per student"
All Star has locations all over the GTA to better serve our customers. Teaching Ministry Approved Beginner Driver Education Courses since 1987 Register Now! All star driving school was founded in 1980 and thrived on the conscious effort that the customer comes first. All Star is well known for producing strong and confident drivers. Safety is our number one concern. Reasonable and attractive pricing - you will get the best rates for our quality training! Flexible installments are available to better suit your needs. You have two options to register with us: by phone or online. Once you register online, we will confirm your registration by email or by phone. All Star Driving School offers MTO approved beginner driver education courses. 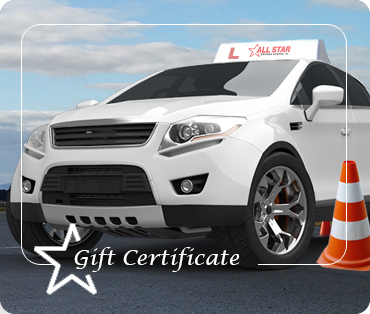 All Star Driving School provides both the mandatory 20 hours held within the classroom and 10 hours of in car lessons. Once both the in class and in car lessons as well as 10 hours of home work are complete, your driver's license history will provide proof of your successful completion of and graduation from a BDE course, which is widely recognized by the insurance industry as proof of course completion. Our in class location is bright and always kept clean, with a fun and upbeat vibe which remains educational as we properly prepare our students to be the best and safest drivers they can be. Our courses are available year round; we offer weekend classes, evening classes through the fall and winter, 4 day holiday classes as well as week day courses throughout the summer holidays. If you are unable to attend a session you can always make it up at any point during a period of one year. 99% Driving Success: Our defensive driving school is aimed at providing our students with theoretical and practical knowledge, which guarantees their future success on the road. The Driver’s Licence History provides proof of successful completion of and graduation from a BDE course and is widely recognized by the insurance industry as proof of course completion. Gift Certificates: Gift Certificates are available all year through, and are available in any amount. Talk to us today about this special service. Gift Certificates are great for Holidays, Birthdays, Graduation, etc. When it comes to our team, we at All Star Driving School insist on setting precedence. Our top priority is our students and their well-being. The success of our students is our reward. Our team members, whether in the classroom or out on the road have the same principles and are all dedicated and well-educated in the art of coaching our students to reach their full potential!